• Please bring your used games to Diversions between Friday, March 15 and Tuesday, April 2 with the completed form (see link below). All games must be in new, “like new,” or very good condition with no missing components. • You may set your own price for each game but all used game sales must be facilitated by Diversions and the payout will be provided to sellers in store credit only. Used games may not be sold directly for cash during this event. • Any used games not sold during this event must be taken back by the seller no later than Friday, April 19. Diversions will not be holding any games for trade-in credit. Any games not claimed by this date will be disposed at Diversions’ discretion. 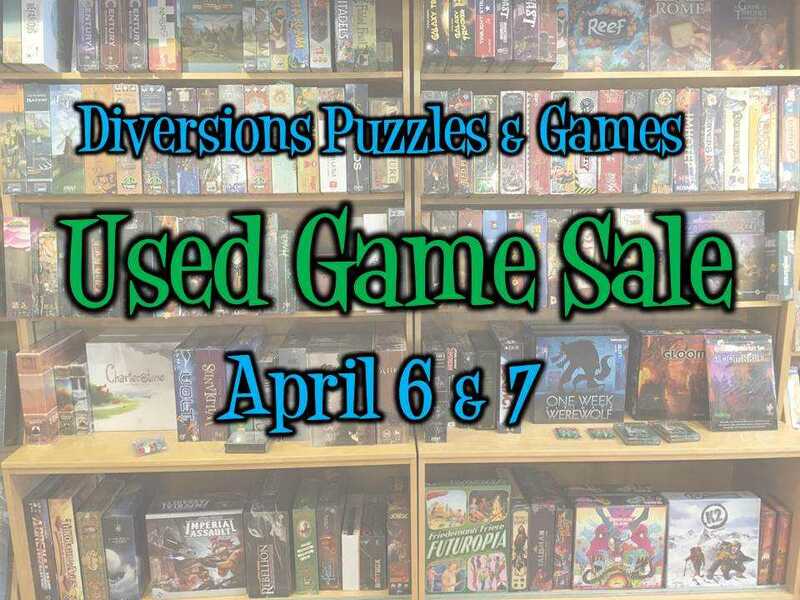 • Store credit will be applied in the form of a gift card to Diversions and will be available for pick up beginning Tuesday, April 9 along with any unsold games. • All used games will be sold as is and cannot be returned for any reason. Click this link for the used game sale form. Please bring a completed copy of this form when you drop off your games. Please e-mail portsmouth(at)diversionsgames(dot)com, call (603) 766-6220 or comment below with any questions!